CHIKARA Young Lions set kicks off the 2018 Filsinger Games releases! Happy New Years from Filsinger Games! To kick off 2018 the right way we are happy to announce that later this month we will release the newest game edition for CHIKARA, entitled Young Lions. The Young Lions Cup is the longest running honor in CHIKARA, and this past year saw the most Young Lions Cup title changes of any season in CHIKARA history. This 8-card set will highlight many of the names that won the Cup in 2017 and will have an impact on the promotion for years to come. The first name debuted in the Young Lions Cup tournament in 2017 and has made a “splash” since that debut. 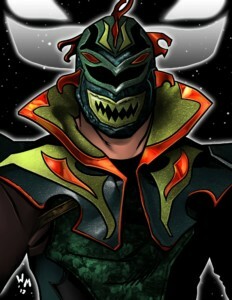 Merlok is the Murky, Murderous Menace of the Deep and has laid a path of destruction through the CHIKARA roster in Season 18. One of the largest competitors on the roster, he knows how to through his weight around before finishing off opponents with the Emerald Flosion. Merlok is sure to continue his winning ways in 2018 and challenge for the CHIKARA Grand Championship. CHIKARA Young Lions will be released at the Season 19 premier in Philadelphia on Sunday January 28th, and will begin mailing on January 31st to the Chikarmy worldwide! ← GalactiCon 2018 Will Invade the Steel City on July 13-15!